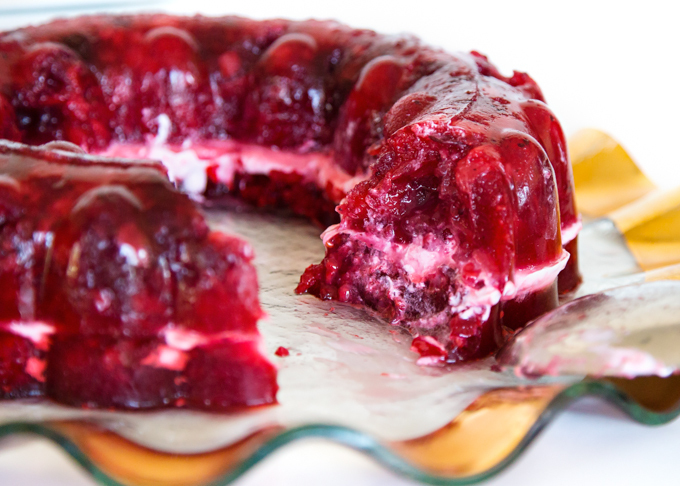 This Cran-Raspberry Jello Salad has been on my Thanksgiving and Christmas dinner table ever since I first tasted it. 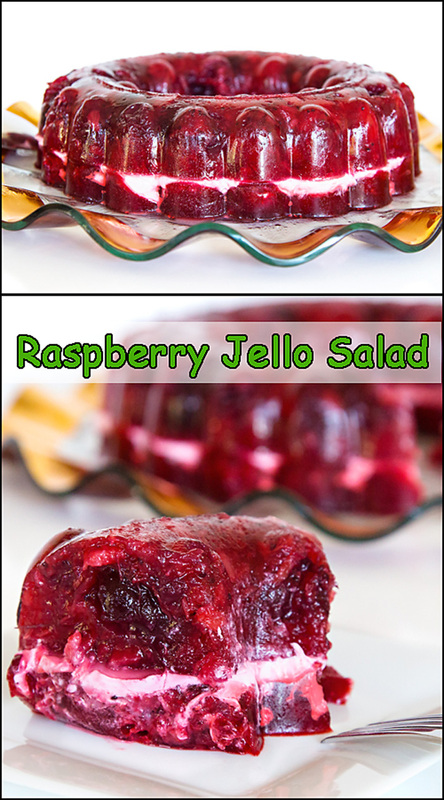 I’m not much of a Jello salad fan, but this one deserves to be sitting next to the turkey on your holiday table. It’s that good! 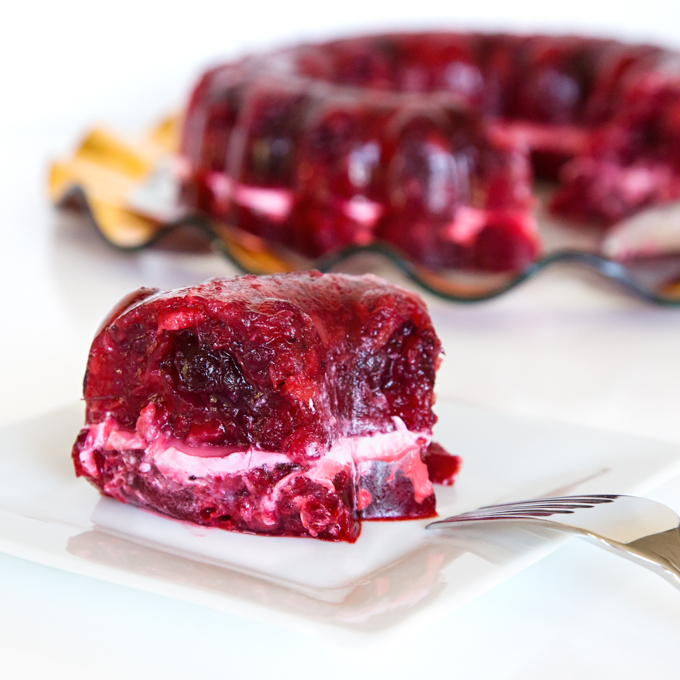 The center layer of sour cream is just enough to offset the sweet jello and the tartness of the cranberries. I love remembering the old friends that shared recipes with me. This Cran-Raspberry Jello Salad was given to me by a gal that I worked at the bank with probably 35 years ago. Oh my good golly, that means, excluding the years we spent traveling on Thanksgiving, I’ve made this salad probably 50 times! I’ve also been making it in the exact same Tupperware Jello mold for all those years. And now, I’m kind of cracking myself up, I just looked it up online, and yes, they still sell the exact same “ring mold.” Obviously, if it lasts all these years, and the jello pops out easily, it’s worth having!! **I believe my jello mold is a 9 cup (possibly 12). 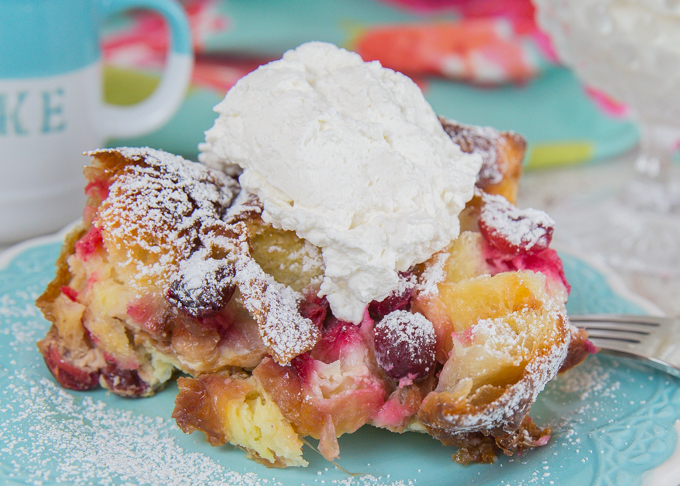 This recipe fills my jello mold to the brim. 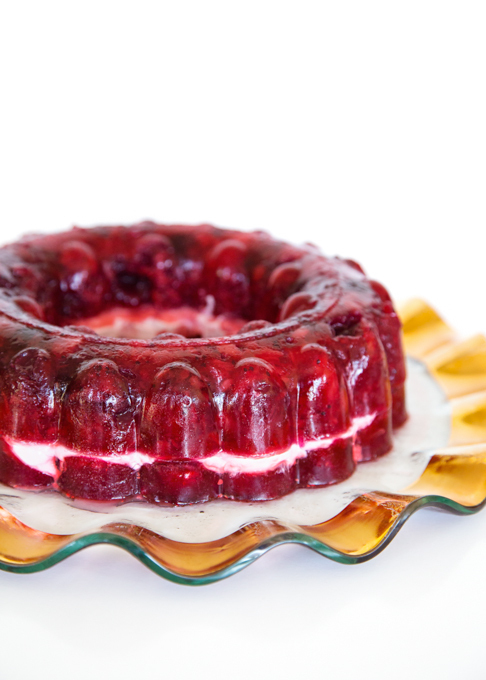 If you have a smaller mold, you can either make two, or simply put the extra layers of the jello recipe into a small mold. It won’t be as fancy, but it will taste just as good! Cheers to old friends and new recipes!! Mix strawberry jello with 1½ cup hot water until dissolved. Stir in 1 cup whole cranberries and can crushed pineapple. Pour into large jello ring mold (*see note above), refrigerate until set. Spread with a thin layer of sour cream, let set. 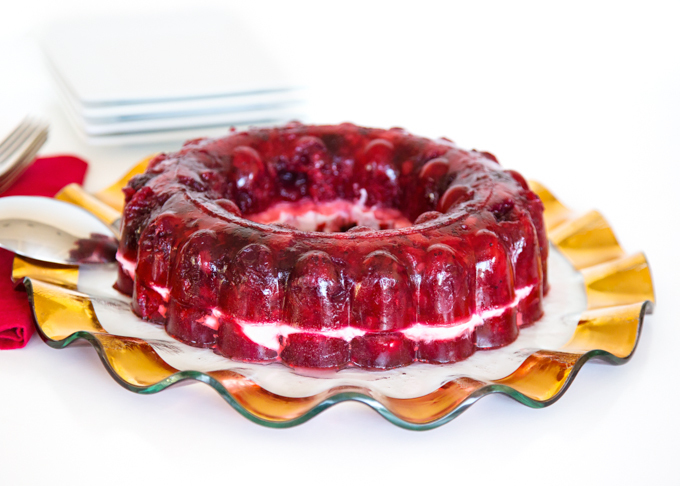 Mix raspberry jello with 1½ cup hot water until dissolved. Slowly pour (or spoon) raspberry jello mixture on top of sour cream layer. refrigerate until set. Remove from jello mold and enjoy. Can’t wait to try this 1 on the table this year!! Jello Molds remind me of my Aunt Harriet! What great flavors for a dessert! Such a holiday tradition! Gorgeous! 1 can of whole cranberries? Is that like cranberry sauce? #2 can = ? oz. 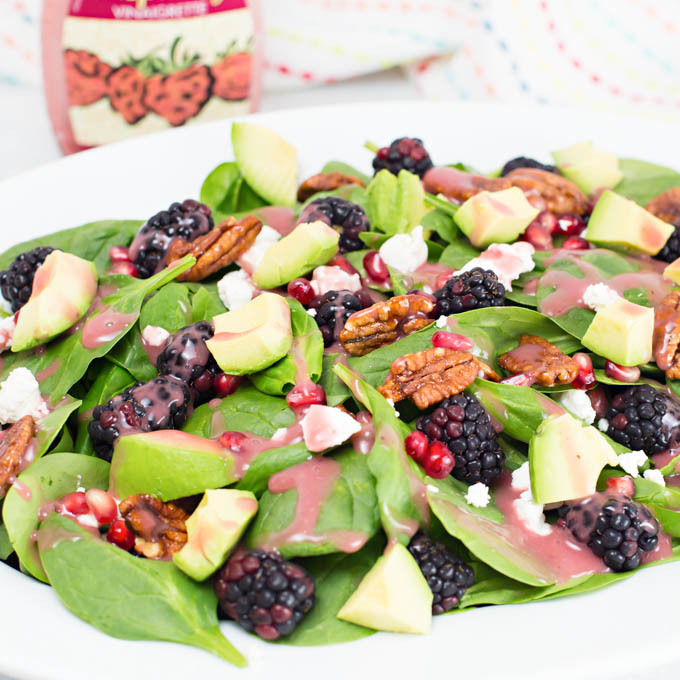 I’ve never had jello salad before – but this looks yummmm! Do you think you could sub cream cheese for the sour cream? Thanks! Can you substitute creme fraiche for the sour cream? How do you think substituting creme fraiche for the sour cream would work? I expect that should work just fine, but I have never tried. It is surprisingly good with the sour cream. Please let me know if you give it a try and how you like it. A friend brought this to church last Sunday for our church family Thanksgiving dinner. I don’t see a lot of Jell-0 offerings anymore, and I do like them. I tried this one and it is amazingly delicious. I asked her for the recipe, she emailed to me, and it has just become a part of my Thanksgiving and Christmas dinner menu. Thank you, Renee! Followed the recipe using 2 strawberry jellos, 2 raspberry jellos, 1 can pineapple (20 oz.) 1 can cranberry sauce (14 oz.) and it fills 2 (6 cup) molds, not 1. Luckily I have an extra mold. Definately had to use 2 of my Tupperware molds which look like the pictuure. Or 1 12 mold. (maybe they made bigger molds in the old days). Thanks for the warning, Barbara. How well should the pineapple be drained. Hi Colleen, you don’t drain the pineapple. What size mold do you need. I see people have struggled w/that. Seems like a lot of ingredients for one mold. Do you need a 9 or 12 cup mold? Both are hard to find. I believe the ring mold I use is a 9 (maybe 12 cup) and the recipe fills it to the brim. 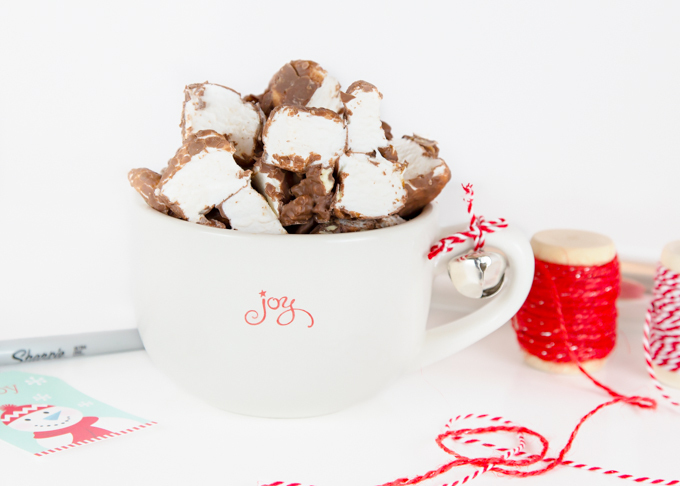 If you have a small mold or extra ingredients, you can always use two smaller molds or make the extra in a bowl. I have a family member who is allergic to pineapple. 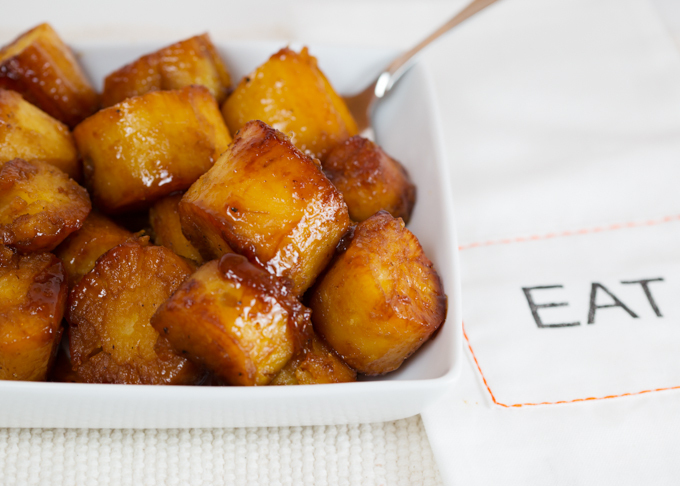 Do you have any suggestions for a substitute for the pineapple? I do also and maybe sub the same size can of canned cherries in juice? Or diced pears? It will change the flavor for sure but will probably be good too. 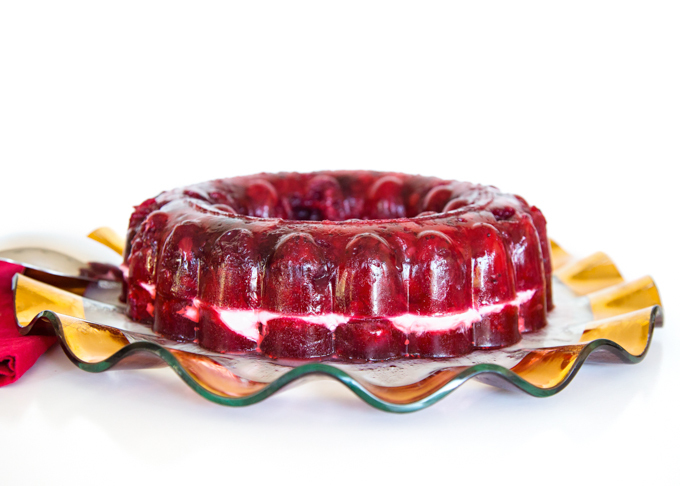 My classic Tupperware jello mold was filled nearly all the way with the first layer. How did you make it fit? I just skipped the other layers and added the raspberries. There must be different size molds?